These unique pancakes rich in iron are an easy recipe for your breakfast or snack. 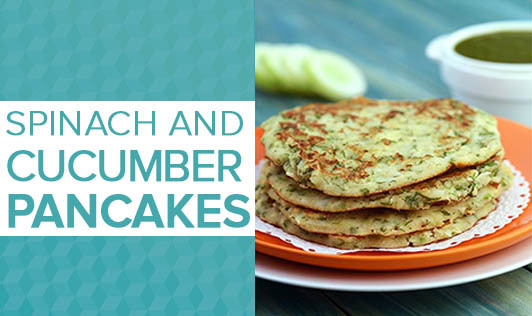 Note: To prevent sogginess - remember to squeeze out water from the cucumber and pack the pancakes only after cooling. 1. Combine the cucumber and salt and keep aside for 10 minutes. 2. Squeeze out the water from cucumber and combine all the remaining ingredients in a bowl. 3. Add enough water (approx. ¾ cup) and mix well to make a smooth batter. Keep aside for 10 minutes. 4. Divide the batter into 6 equal portions and keep aside. 5. Heat a non-stick tava (griddle), spread a ladleful of batter to make a 100 mm. (4") diameter circle. 6. Cook on a medium flame using ½ tsp of oil till it turns light brown in colour on both the sides.